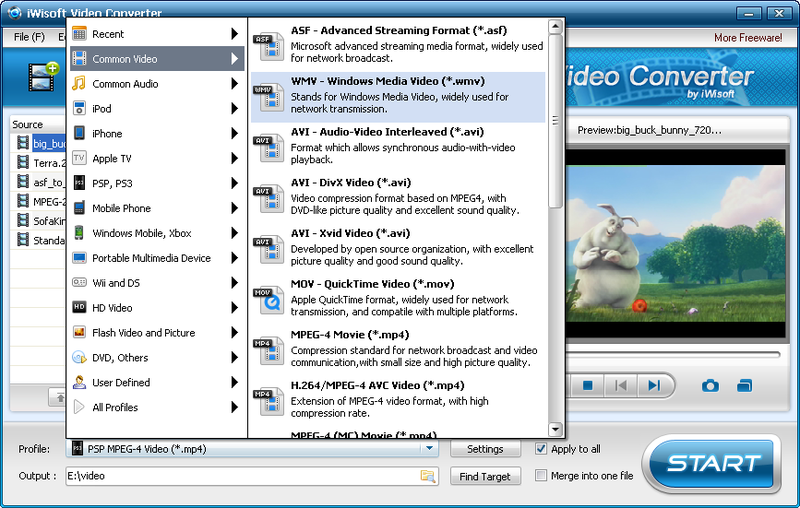 Free Video Converter: convert video files easily, AVI FLV WMV MP4 MKV MOV converter. iWisoft Free Video Converter New! iWisoft Free Video Converter can fast convert videos between all popular formats like AVI, MPEG, WMV, DivX, XviD, MP4, H.264/AVC, AVCHD, FLV, MKV, RM, MOV, 3GP, and audio MP3, WMA, WAV, RA, M4A, AAC, AC3, OGG. Directly convert video for playback on your PSP, iPod, iPhone, Apple TV, PS3, Xbox, Zune, Creative Zen, Archos and other digital multimedia devices. The video converter also has powerful video editing functions including crop, trim, merge, adding watermark and special effects. And it's totally free! New Freeware! iWisoft Free Video Downloader has been released! Visit www.iwisoft.com for details! General 3GP mobile phone, BlackBerry, Gphone, Palm Pre, etc. General MP4 players: Zune, Walkman, Archos, Creative Zen, iRiver, etc. Window Mobile device: Pocket PC, Dell Player, HP iPAQ, etc. iWisoft free video converter is a professional video and audio converter that supports almost all media file formats. Convert various videos to AVI, MPEG, WMV, DivX, XviD, MP4, H.264/AVC, FLV, MKV, RM, 3GP, 3G2, MOV, etc., and extract audio to AAC, AC3, MP3, MP2, OGG, RA, WAV, WMA, M4A from videos. Convert video between multiform High-Definition movies, such as H.264/MPEG-4 AVC, AVCHD Video (*.m2ts, *.mts), Apple TV h.264 720P, MKV, HD WMV, MPEG2/MPEG-4 TS HD Video, etc., as well as convert video from High-Definition to Standard-Definition for watching. Convert between MP3, MP2, WMA, WAV, OGG, M4A, AC3, AAC, RA, APE, FLAC, AIFF, MPA audio and more. Directly convert video for playback on iPod, iPhone, Apple TV, PSP, PS3, Xbox 360, Wii, Pocket PC, Blackberry, Mobile phones, Zune, Creative Zen, Archos, HP iPAQ, iRiver and more digital devices. Support converting multiple video & audio files in batches to save your time! Not only that, it can handle one file to multiple formats at the same time. Simply adjust output video and audio settings with iWisoft free video converter. Luxuriant, optimized and classified video & audio profiles help you easily convert any video and audio to fit your digital devices. Allow you to adjust any profiles by setting video codec, video size, video bit rate, audio codec, audio bit rate, audio channel, audio volume, etc. to convert, and you can save your settings as user defined profiles for future use. A smart bit rate calculator tool is built-in in this video converter to estimate the output file size. Get more fun using iWisoft free video converter without any technique knowledge. You can preview the editing effect before conversion! Easily crop frame size to keep your wanted area in the frame. Trim your video or audio to convert your favorite movie or music clips. Add special effect on output video, such as adjusting gamma, brightness, contrast, saturation, and gray, emboss, negative, old film effects. Add text or graphic logo with customized transparency, size and position onto your created video. Merge multiple videos into a single file. Capture video pictures into gif, jpg, bmp, png files while playing video. Preview the video in real-time while editing effect before conversion. iWisoft free video converter is designed with user-friendly interface that makes it couldn’t be more easier to use. All pertinent options are easily discernible and readily available from the main interface. Just with 3 clicks, you can get the wonderful movie with iwisoft free video converter. Easy to use for both beginners and advanced users. Convert files at high speed and can automatically shut down your pc after conversion. Exactly synchronized audio and video. No skipped or lost frames during conversion. Create output files with excellent video and audio quality. "I've been using iWisoft Video Converter for a long time and find it to be a great video converter. It is simple to use. It provides all the functions required. I have and will continue to recommend it to my associates in need of this type software. Excellent!! " "What more can I say?" "This is an excellent tool for converting video files to any video format. Anybody can use this, it's so easy. And the results are superb as well! What more can I say? :) This app rocks!" "This video converter rocks.... one stop solution to convert all videos and audios. You can set the codec, bit rate and frame rate. You can split, crop, merge videos as you like. It also convert clips of video to animated gifs...Overall, a must have if you convert lots of video files. " "Fabulous video converter if you want convert videos to iPod. It does just what it says it will. With a simple user interface that required NO learning process! Now I have many videos on my iPod which are all converted by iWisoft Video Converter." Copyright © 2011 iWisoft Corporation. All Rights Reserved.